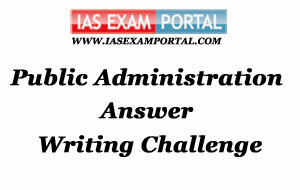 Weekly Mains Exam 2016 Answer Writing Challenge - Public Administration "MODULE- 45" | IAS EXAM PORTAL - India's Largest Community for UPSC Exam Aspirants. Weekly Mains Exam 2016 Answer Writing Challenge - Public Administration "MODULE- 45"
Public Administration- Paper I "Syllabus Topic – Accountability and control : Right to Information"
Q1. "To transform RTI regime and access to information regime requires several legal , administrative and judicial issues to be addressed adequately. " Discuss. The CIC to be given more teeth as a Statutory Body so that the Executive and Legislature cannot circumvent its orders. The IAS lobby dominates Information Commission is mostly averse to dissemination of information. ARC II recommends centralisation of Information records in order to comply with the suo moto disclosures. Government must use tools of Education, Information and Communication to empower every citizen with the RTI and must use mediums like street plays, advertisements and simulations . Departments have expressed lack of budgets and personnel in implementation . Indian Administration- Paper II "Syllabus Topic – Union Government and Administration: Commissions"
Q2. Highlight the key recommendation of the 14th Finance Commission WRT implementation of GST.